It is no surprise that Moverman is being recognized as one of America’s foremost independent filmmakers in a short period of time. Paying great attention to visual style as well as sonic and narrative elements of his films, the director offers an observational cinematic piece that is both powerfully empathetic and transformative for the perception of an unwanted and disconcerting part of society. Time Out of Mind is a fairly simple film, with an easy to follow premise. What draws the film to the territory of deep pain and sentiment is the process in which the film so obviously takes to deliver a multi-layered understanding of the most unnoticed population of society. 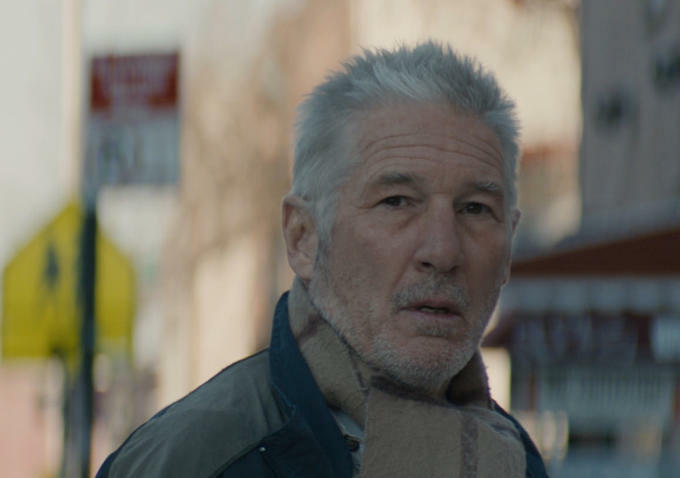 One of the first and more interesting details that draws our attention to the film is the choice to cast Richard Gere as George; a disheveled and drunk homeless man. Barely walking the streets of New York City, drunk, humiliated and decrepit, Gere embodies to the best of his abilities the ‘typical bum’. An American acting master and icon known for his more debonair roles, Gere covers himself in rags and abandons the riches to play George, a man who describes his existence as one, big life-long quarrel. Down on his luck and left with nothing after the death of his wife, George, barely fighting off the frigid temperatures of the Big Apple after being kicked out of a dilapidated apartment, finds refuge in one of the few temporary housing projects found within the concrete jungle. More like a prison than a home, George finds minor solace once he befriends a seasoned homeless man Dixon (Ben Vereen) as well as various opportunities to re-connect with his daughter Maggie (Jena Malone). Once the audience gets over the bizarre casting choice of Gere in the lead role, we are able to observe, as Moverman does, the bigger picture. Moverman, along with director of photographer Bobby Bukowski (who seemed to have more films at TIFF this year than the Weinstein brothers), achieve excellence in the visual style of filmmaking for Time Out of Mind. Adopting a distinct, original perspective by placing a very displaced and stagnant George (Gere) amongst the bustling and busy city of New York, along with its people, shining street lights and fast-paced tempo, George’s isolation as well as self-deprecated demeanour is always seen and understood from a distance without ever really getting too close. While the star and filmmaker professed that much of the filming took place on the New York City streets during the day, when Gere was in costume, no one seemed to recognize him nor cared to be very close to him. This initial, obvious reaction by people when they are seen coming into contact with homeless individuals, is embodied fully by Moverman and Bukowski, thanks to the use of shooting scenes on rooftops, through the reflections of puddles, liquor stores or ultra-zooming the lens from blocks away. In a way, the film is a highly researched yet fairly obvious mentality of people who go out of their way to notice and avoid the street walkers of big cities. Time Out of Mind, simply for being an innovative look at the life of shelter-dwellers, casts a very respectable spell on its audience. Although the film may seem thirty minutes too long, Moverman delivers an intimate portrait that discovers uncharted territory in independent American cinema using A-List Hollywood talent. Gere, who is front-and-center as George throughout the film, never taking a break away from the camera, really delivers on, what seemed to be his passion project. Sadly, Gere, who is still solid as George, never really allows us to believe in his strife. Operating at low gear, torquing and reeling in his audience with subtle charm and wit, Gere is constantly overshadowed, despite powerful scenes, including a delicate moment of realization. Whether hovered over a piano as Dixon, looking at the black-and-white keys, Vereen outshines Gere as a talkative homeless veteran, delivering nuanced and emotionally responsive scenes naturally and effortlessly. Yet, the real star of the film, given her limited screen-time, is Malone, a Moverman staple, who steals scenes with Gere in a laundromat, on the streets, or in the final scenes of a bar. Malone’s facial expressions alone captivate, and comment greatly on a usually undocumented time when children, who are equally struggling in life professionally, emotionally and mentally, have to be the ones to support their parents, and not the other way around. Malone is nothing short of an acting revelation. Time Out of Mind is the quintessential definition of Moverman’s experimental apathetic filmmaking technique. George is living in a world that is constantly moving and happening around him. Life is literally passing him by. It is in his stillness, Moverman’s confident casting decision and powerful commentary that the film allows us to forget it’s flaws of pace and time. Time Out of Mind may not be the best film coming out of TIFF this year, but I can assure you that there are authentic moments of realization and deep meaning that truly launches audiences’ appetite for greater meaning and thought. Questions such as; how you would handle a homeless man the next time you are approached on the street alone, is reason enough to watch the film. Showcasing the marginalized souls populating city streets is not easy. Neither is allowing for Moverman’s feature to consume us completely. The film is no easy watch. Yet, Time Out of Mind provides audiences with a time where we are out of mind, out of body, and become the very fabric of every person’s worst nightmare–imagining the fragile world of people without a home, and a film like this may be exactly what we need. Night Film Reviews: 7 Stars Out of 10. **Congrats to the film for winning the illustrious International Critics’ Prize (FIPRESCI Prize) in the Speacial Presentations programme. What did you think of Time Out of Mind? Captivated, compelled or completely bored? Leave you’re thoughts and comments on the film below and make sure to check out these exclusive TIFF videos of the film below. This is watching a man who has developed such an intense love & understanding of his craft that he can not help but be a fabulous actor!!!! He is indeed fabulous and if the talk is right, Gere might even be in contention for some Oscar love for his role in this film. We shall wait and see. Seeing Ben Vereen after so many years in this movie was a treat. For sure he is the most transformed character in this movie to the point of being unrecognizable and his performance was beyond believable, excellent! A poignant and thought provoking depiction of homelessness that makes it’s point clearly and gives visibility to the invisible!! It was great seeing Vereen in the role. Many of the younger generation might recognize him as his quick but very memorable role as Will Smith’s absent father in The Fresh Price of Bel-Air. He is by far the better of the male characters in the film.